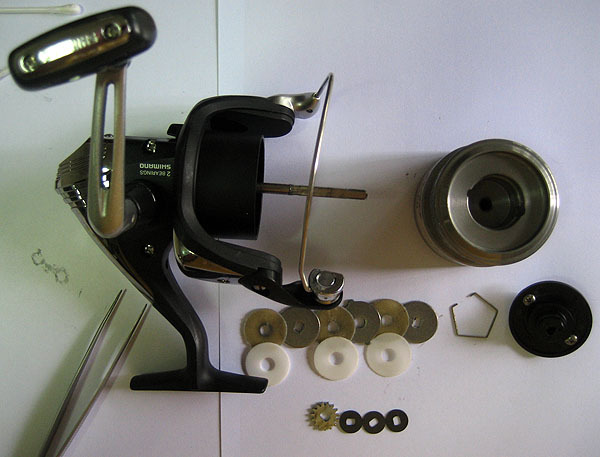 Have you wonder how the drags in your spinning reel works? Do you know what is it use for? If you have and you're interested to know more, do read on. Let’s start by looking at how it works. The drag on a fishing reel works on the principle of Friction. There are spinning reel with front drag, rear drag or both, the latter is call a Bait Feeder reels. We will use a front drag reel for this demonstration as most of the spinning reels used by anglers are front drag reels anyway. Looking at the diagram above, it’s a cross section of a spool of a spinning reel, that's where the drag mechanisms are, for a front drag reel. In this example we're using the more common 3 washer setup. The purple blocks are the cross section of the Key Washers (that’s the metal washers with the rectangular key hole in its centre), the red block is the Eared Washer (that’s the middle metal water with two bums or ears sticking out) and the blue blocks are the Drag Washers or Drag Pads that could be of any suitable material. 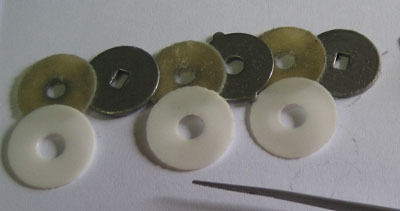 In the picture below, the drag pads shown were the default that came with (most low to mid end) the reel and are made of felt like material, they were originally white but after greased and used for some time it has turn yellow. The white washer you see in the picture are made from Telfon material, they were to be use for trial to see Telfon is suitable for my use. Anyway back to the first diagram. When a fish is hooked and assuming that the angler has set the drag right (we'll get to that shortly), the reel is expected play out line in a smooth and continuous motion. What's happening in your drag mechanism when this is happening is as describe. The drag well, which is also part of the structure of the spool of your reel starts to turn, when that happens the Eared Washer (as it's ears are lodge in the drag well wall) also turns with the spool. 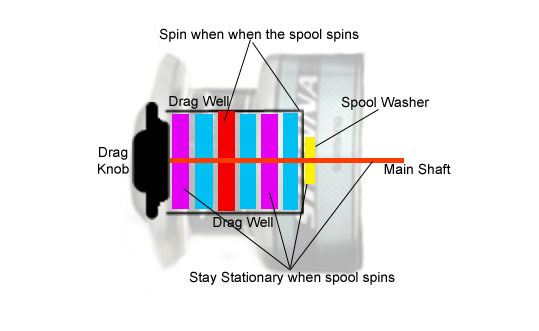 But the purple coloured Key washer will remain stationary as they are not connected to the wall and also because the main shaft (only the portion of the shaft in the drag well is rectangular in cross section and fit neatly into the key hole of these two key washers) is not rotating, assuming the anglers knows to stop reeling when a fish is taking line. So the friction on both sides of the 3 Drag Washers provides the resistance to how fast or how easy the spool can rotate or the fish can take line. Therefore, the drag power of your reel equates to the resistance the Drag Pads can provide. The variable here that can change the resistance in this set up is the Drag Knob, the tighter you screw it in, the more compress are the washer and the resistance between the washers increase. Anyway, things are never that straight forward in life are they? Well, same thing for drags too. Remember at the beginning of this write up I mentioned "friction"? Well let’s talk about how friction affects our drag. Assuming the angler set the drag right (yes, yes .... we'll get to that shortly. Promised. ), there will be a pressure applied on the drag washer from the drag knob to keep the spool from rotating at the slightest pull of the line. This resistance on the drags that keep everything in position is call Static friction. To get the spool rotating again, a force (pulling force in this case) greater than the Static friction needs to be applied. So, you slowly apply a force by pulling. At one point the grip release and the reel starts to move. The peak of the amount of friction you need to overcome, to move the spool is call Limiting friction and that my friends is what we're actually setting, when we say that we're setting our drags. Once you've digest this, forget about it for awhile. Now that the spool is rotating, the resistance of the drag pads on the metal washer and bottom of the drag well are still there, but the type of friction that is acting on the sliding surface is now call Kinetic friction. On a side note, kinetic friction is really interesting because it is due to chemical bonding instead of what I expect it to be, you should read about it if you're interested in science. Anyway back to our topic, we were talking about kinetic friction. The characteristic about friction generated "between most materials" is that it usually has a higher coefficient of Static Friction compare to Kinetic Friction. In lay man terms, the Static friction between two surface is usually higher than the Kinetic friction between the same surface, that's why we normally get a jerking effect at the instance the spool start moving, in tackle terms this is sometimes refer to as "start-up" effect, once the spool starts to move you actually need less force to overcome the kinetic friction to keep it moving. So now we know that to have a smooth drag, a good material for drag pad is one that the coefficient of Static and Kinetic friction is as close as to one another as possible when it is run across the metal washers. Wow! I hoped you took that in well, took me a few rewrite to make sense to myself.. So what makes a good drag pad material? As we can guess kinetic friction is the biggest contributor to wear and tear, therefore our drag pads should be made of material that can take a certain amount of "rubbing" under pressure. Material that breaks down easy, not only reduce the drag pads performance, the microscopic particles that has fallen off can interfere with the kinetic friction we talk about thereby producing a jerky or sticky drag, which we do not need when fighting the fish of our lifetime. We also want certain amount of compression, so that we can increase the drag when we need it. When we compress the material toward the metal washer using the drag knob, more of this material gets into contact with the metal washer at the microscopic level, when more surfaces is in contact we get higher amount of friction (Static, Kinetic and Limiting). The higher amount of compression the material can give the higher the range of drag setting we can get from the reels. At the same time we need the material to be able to recover to its uncompress state once we release the pressure. In our reels drag system, if the material cannot recover well, when we release the tension on the drag knob, we will realise that we lose a lot of drag power just by a small tweak of releasing the pressure on the knob and that's not a good thing as we need micro control over the amount of drag (both up and down) we can apply when we fight a fish. That's why once the original felt drag pad that comes with your reel (or drag pads of any other material) get compress beyond the state which it can recover you need to change it. Lastly, with all this rubbing and friction going on there's bound to be heat generated, lots of it actually. Especially if the fish goes on a fast and long run under a tight drag. The drag material therefore must have the ability to withstand the heat and not distort or change its performance as heat increases. 1) Very low difference in its coefficient of Static and Kinetic friction with the metal washer. 2) Tough and not easily broken down. 3) Compressible and recovers well. There are a lot of material out there that have been used for fishing drag pads over the years, enough to write another topic on it actually. But this part of the drag is also been most written about, so you can search the web should you be interested and you should be able to find many good write ups on materials and the author's opinion of them. And that covers the "How it works?" question, the next question which we want to answer is "How or what is it use for? Well ....... according to the expert on web page design, a good web page shouldn't be too wordy or lengthy. Reader will lose interest and avoid reading it altogether. So taking this advise ........ do look out for my part 2 of What a Drag. Thank you.